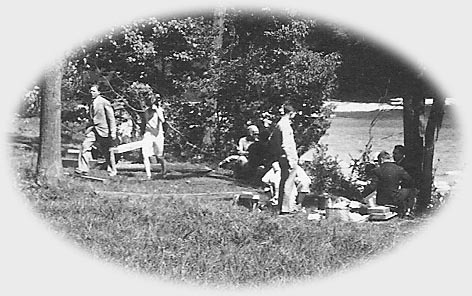 "Near The River, Letchworth State Park"
Although the area had once been the site of mills and farms, the area on the west bank of the Genesee between the Upper and Middle Falls had become a busy picnic area by the 1920s. This did not occur by accident - the Letchworth Park Committee in charge of developing the Park had taken specific steps to attract the tourists such as those shown in this postcard. The opening of the Portageville Entrance, the construction of a comfort station, improvements to the roads and trails, along with the parking areas brought crowds to the spot. Details of the picnic scene is shown below. Thanks to our friend Karen Gibson Strang for sharing this view with us!